Putin, as The Washington Post reported, was implicated by a British inquiry in January in the poisoning death of Alexander Litvinenko, a former KGB operative, in London in 2006. The murder of Alexander Litvinenko, a former FSB agent who was engaged in anti-Russia propaganda, primarily against Putin who he claimed committed the 1999 apartment-building bombings in Russia for political gain killing scores of people including children. The British government ran with the Livinenko story which said he was poisoned on British territory by the Russians while sipping a cup of tea laced with a dose of highly radioactive “Polonium-210.” Why? Because it is well known that Polonium-210 is produced in Russia, so it is convenient to blame Russian intelligence services. It is important to understand that Polonium-210 is highly radioactive and highly toxic that would have contaminated airports and the planes from Moscow to the UK and everyone in close proximity to the deadly radioactive substance. If the FSB wanted to kill Livinenko, there would have been numerous ways to do so, but by placing Polonium- 210 in his cup of tea? What about the waiter or waitress or the person who served him the tea or the customers around him? Wouldn’t they have been contaminated as well? The FSB agents or Putin for the matter cannot be that stupid. Why would the Russian government commit a crime with a highly toxic substance that can be traced from Europe all the way to the door steps of the Kremlin? We don’t know how true Mr. Scaramella’s statement is, but it does make more sense than FSB agents dropping Polonium -210 in Litvinenko’s cup of tea. However, Russian authorities denied any involvement with a nuclear smuggling operation carried out by Litvinenko. For any criminal organization, someone like Litvinenko would be considered a “snitch” and suffer the consequences. Litvinenko’s murder has two possibilities that seem more plausible. The first possibility is that he mishandled the nuclear material he was importing to the UK and got himself exposed to the deadly substance or the Russian mafia put out a contract on his life. Either explanation is more believable than dropping Polonium-210 in his cup of tea right in the city of London. 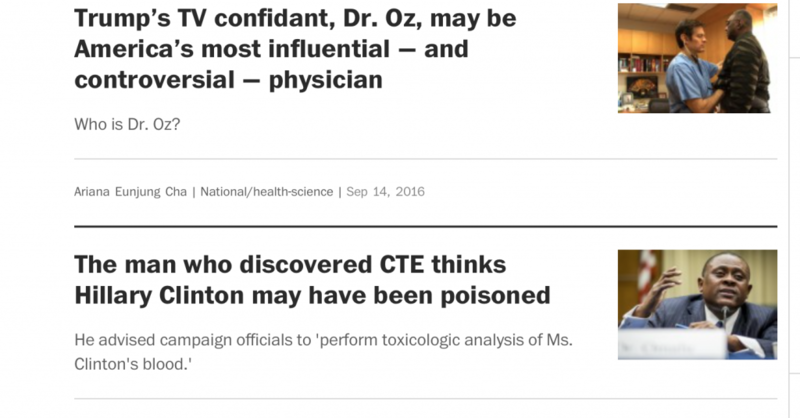 The MSM accuses the alternative media of spreading “conspiracy theories” on Hillary Clinton’s health issues. But it was all put to rest after the ceremony for the victims of September 11th in New York City when Hillary nearly passed out. The MSM will continue to cover for Hillary Clinton any way possible even if it means spreading more conspiracy theories. It’s amazing how the MSM is promoting Dr. Omalu’s accusations that are absolutely ridiculous. I guess this is what to expect from a media that can’t even follow journalistic principles of reporting the truth, but hey, at least the MSM is becoming more entertaining with stories that make us laugh. Reminds me of what you find in the supermarket tabloids like The National Enquirer.